Over the last few years, IHG Rewards Club has made it a lot harder to earn top-tier Spire Elite status by restricting the sort of points which count towards it. I wrote a long article here looking at the different ways of earning IHG points and whether or not they count for status. What this means is that unless you spend £37,500 in a calendar year on the IHG Rewards Club Premium Mastercard or book a lot of stays which come with a bonus points package, you will need to spend $7,500 before VAT at InterContinental, Holiday Inn, Crowne Plaza etc hotels in a year to earn the 75,000 base points required for Spire Elite status. Unless you’re me, of course. Back in 2015, I used the one roundabout route left to earn those key 75,000 base points. By making transfers to IHG Rewards Club from Virgin Atlantic Flying Club. This page on the Virgin Atlantic website explains how to do it. You transfer at 1:1 with a minimum of 10,000 miles. I have, in the past, said that transferring Virgin miles to IHG is a bad idea. And, on the face of it, it is. I value an IHG Rewards Club point at 0.4p, so effectively getting 0.4p of value for a Virgin Flying Club mile by transferring it is not clever. However, Spire Elite status has real value. Whilst IHG has never been great in terms of upgrades, you are top of the pecking order now. There is one extra benefit: you receive 25,000 bonus IHG Rewards Club points when you reach or renew IHG Spire Elite top tier status. These points post instantly to your account. There is an alternative of gifting Platinum status to a friend but I have discounted that in this analysis. I value IHG Rewards Club points at 0.4p, based on redeeming 70,000 for a five-star InterContinental night valued at £250+ in a major city. The last one is an acceptable valuations for a Virgin Flying Club redemption, in my opinion. However, you ALSO need to factor in the 100% points bonus that you will receive on your IHG stays whilst you have top tier status AND whatever upgrades and benefits the new tier will bring. That will add extra value on top. You would get the same valuations – 0.57p per Amex point if you transferred 60,000 up to a decent 0.9p per Amex point for transferring 20,000. Again, this assumes ZERO value for the 100% base points bonus you will get as a top tier member on your stays or the value of upgrades etc. The last one is as good as Tesco Clubcard redemptions get, given the devaluation last week. And, again, it ignores any benefits you get from Spire Elite such as a 100% status bonus on your future stays. IHG status years are based on calendar years. It is now only June. I would be surprised if you know, with certainty, how many more IHG cash stays you will have this year. This means that you won’t know how many base points you be ‘short’ for hitting Spire Elite. To maximise value, you should arguably wait until you have done your final IHG stay for the year and then do the smallest Virgin Flying Club transfer possible to hit 75,000 points. On the other hand, you will maximise your upgrade chances and earn a 100% status bonus on your future stays if you get yourself upgraded now. PS. Remember that there is no reason why IHG will keep these transfers as status earning in the long term. For now, though, it works. PPS. 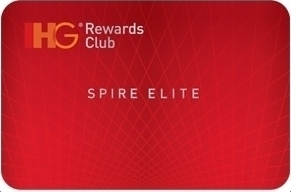 If you are not bothered about Spire Elite, remember that IHG Rewards Club gives our free mid-tier Platinum Elite status with the £99 IHG Rewards Club Premium Mastercard. You also get free Gold Elite status with the free IHG Rewards Club Mastercard. How long is a typical transfer between AMEX Membership Rewards and Virigin, and then again from Virgin to IHG? Virgin is instant if your Amex account is already linked. It takes a week to get to IHG based on my past transfers. Thanks for letting me know, and the article! Or you could just get a curve card, attach the IHG Mastercard and then send your spouse £37,500 in friends and family payments on PayPal for £0. Would this also work with an american express linked to paypal? (As you can’t link an Amex to Curve). I’m guessing you could also do this with the virgin credit cards? Do you have any idea how strict PayPal is when it sees anything which looks vaguely suspicious? I don’t Rob, but I can only imagine, as I know they are pretty good at picking up fraudulent transactions. Have you done this? Can’t see PayPal allowing it.